Light Stuff™ is composed of 30-40 different hand dyed, gauge coordinated yarns. 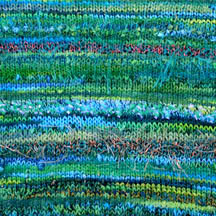 They are tied together end to end by hand, so that as you knit the texture and colors are always changing. Light Stuff™ has moderate eyelash, metallic, and other highly textured yarns. Light Stuff™ has no wool, mohair or other animal fibers in it. Like all Stuffs™, a larger needle can be used for a more open fabric in ponchos, wraps and scarves. We have successfully worked on as large as a #10 needle. Light Stuff™ is slightly thinner than Wild, Cool or Neat Stuff™.